Happy Monday, loves! How was your weekend? Saturday was Ball on the Mall and we had such a blast! I can't wait to share my recap with you later this week. Another thing I'm excited to share? A giveaway! Because we all need a little somethin' extra at the start of a new week! I've been drawn towards dainty jewelry lately and am totally loving all the pieces from J. Jypsy - especially this hand piece! It's the first one I've owned and, I have to say, I'm really loving it as an alternative to a bracelet. It's just so simple and pretty! I also have this necklace in mint that I can't wait to wear! The giveaway is open to U.S. residents only and ends Thursday at midnight. The winner will be announced during the day on Friday! Love this look! The maxi skirt is so pretty! I am dying for that blazer...you look lovely! That color on you is perfection! Loving this look and that sweet little hand chain - gorgeous! The color of that maxi is gorgeous! Loveee that orange maxi skirt.. looks so good on you! Thank you for a wonderful giveaway! I follow J jypsy on FB and I follow you on Instgram. Another great giveaway and gorgeous post. I've been in a dainty jewelry faze lately too. The J. Jypsy jewelry is great because it's definitely dainty, but still original and eye catching. I liked J. Jypsy on Facebook, and I already follow you on Instagram. My email is dkoch3 at gmail dot com. I love your maxi skirt, it's such a pretty color! 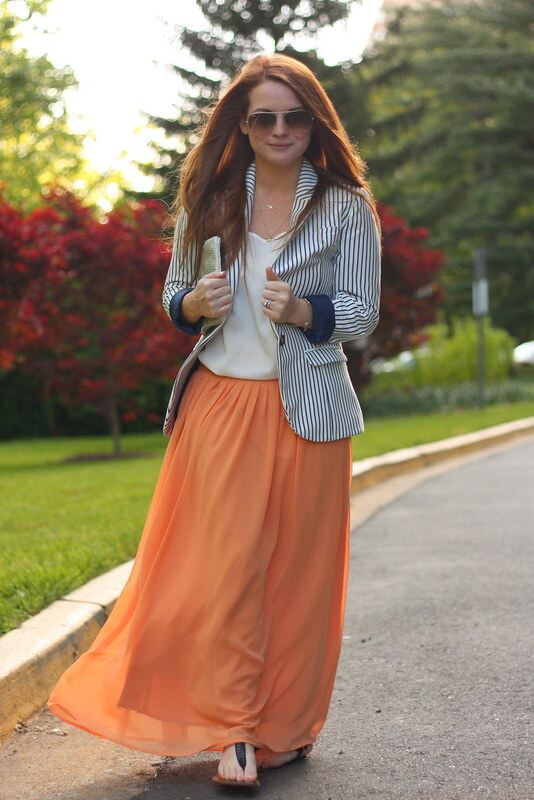 I love the color of you maxi skirt ... and I want that blazer in my closet!!! I've been sizing up delicate handpieces like this one for weeks now, love how you styled yours! Love this! Just liked them on FB and already following you on IG! I'm entering the giveaway and I love your blazer too! LOVE the outfit and the springy blazer! Very cute! Obvi following you on insta. I liked J.Jypsy via my personal account AND fanpage so consider me "entered!" I love that striped blazer and that skirt! Both look great together. Lovely look. This is super cute! I love that you're not afraid to wear orange as a redhead. The flowing maxi and more structured blazer are a perfect pair. You inspire me! Love J. Jypsy, thank you for sharing your unique and stylish finds! You + maxi lengths = perfection! They look so great on you.